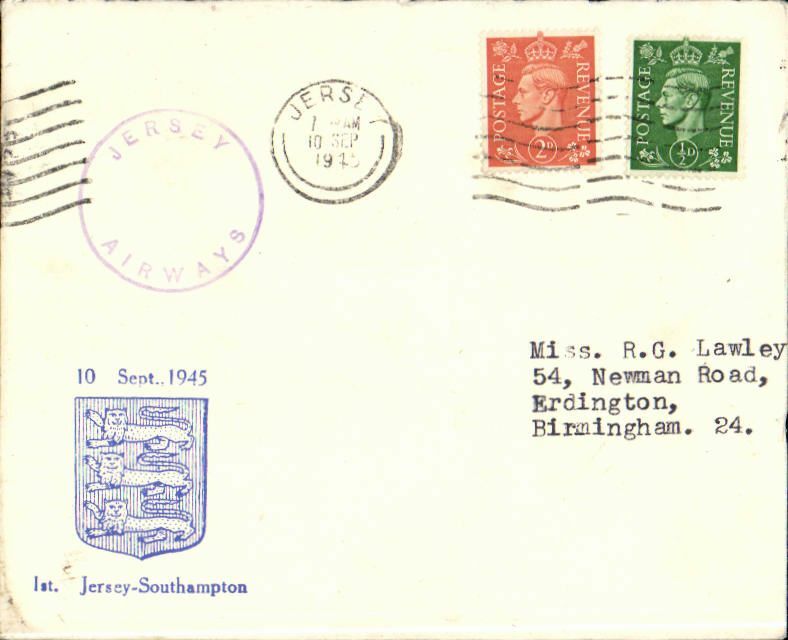 Jersey Airways F/F Jersey to Southampton, plain cover franked 1 1/2d, blue and red Jersey Airways Ltd cachets on front. 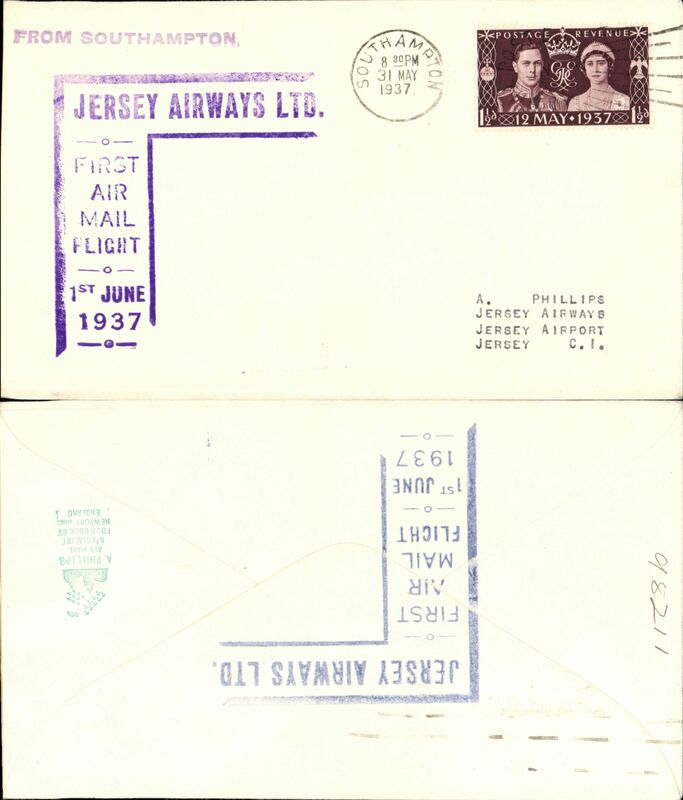 Jersey Airways Ltd, F/F Jersey to Southampton, plain cover franked 1d canc Jersey cds, blue angular Jersey F/F sender cachet on front and and violet cachet of the Company's Southampton office verso, also blue st. line "From Jersey" hs. Jersey Airways Ltd, F/F Jersey to Southampton, and on to London by rail, black double line circular Company's London office 1/7 dated arrival mark, plain cover franked with the Company's meter franking in red, blue angular Jersey F/F sender cachet on front and green angular London F/F receiver cachet verso, also blue st. line "From Jersey" hs. Jersey Airways Ltd, F/F Southampton to Jersey plain cover franked 1 1/2d, violet angular Southampton F/F sender cachet on front and blue angular Jersey F/F receiver cachet verso, also violet straight line "From Southampton" hs. 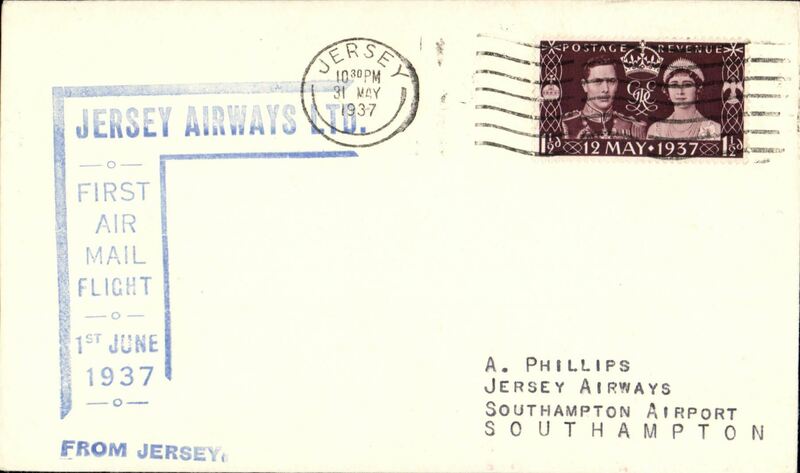 Jersey Airways, F/F Jersey to Southampton, no arrival ds, plain cover franked 1 1/2d, large blue angular flight cachet. 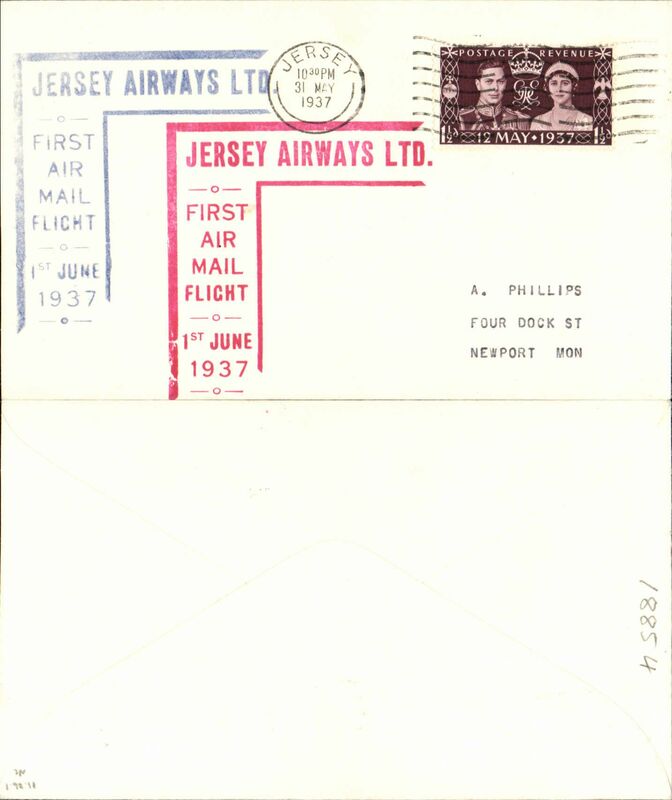 Jersey Airways Ltd, F/F Jersey to Southampton, and on to London by rail, plain cover franked with the Company's meter franking in red, blue angular Jersey F/F sender cachet on front and violet angular Southampton F/F receiver cachet verso, also blue straight line "From Jersey" hs. Jersey Airways Ltd, F/F Southampton to Jersey plain cover franked 1 1/2d, red angular F/F cachet on front and blue angular Jersey F/F receiver cachet verso. 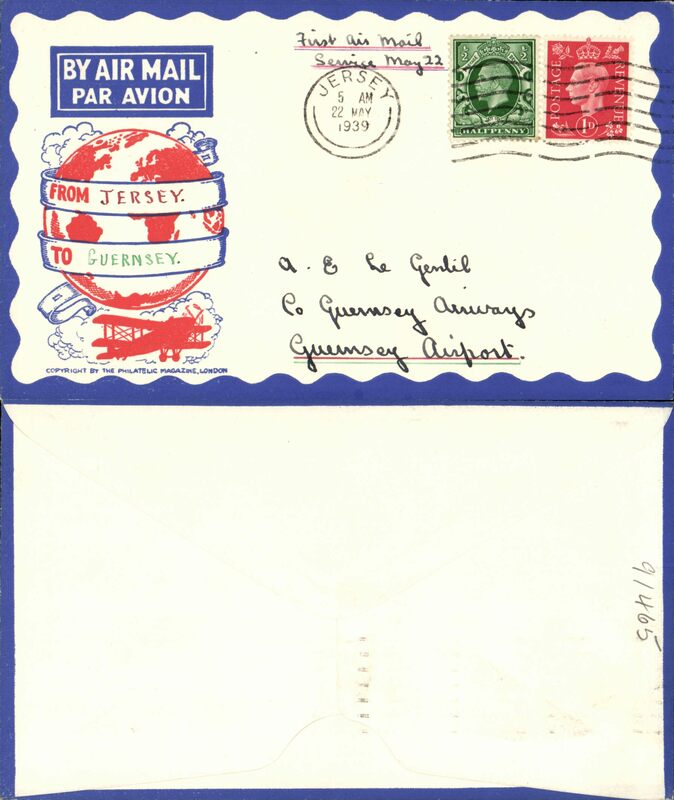 Jersey Airways Ltd, F/F Southampton to Jersey plain cover franked 1 1/2d, red angular F/F cachet and blue angular Jersey F/F receiver cachet on front . 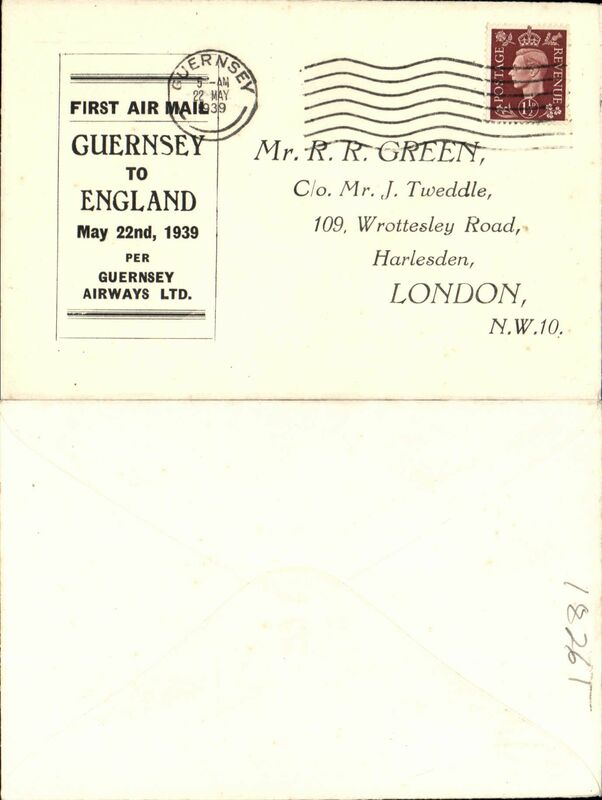 Guernsey Airways, F/F Southampton to Guernsey, typed five line "Airmail Service/Southampton to Guernsey/Channel Islands/inaugurated May 8th/1939", green circular "Guernsey Airways 8 May 1939" Type 5 receiver on front, plain etiquette cover franked 1 1/2d. 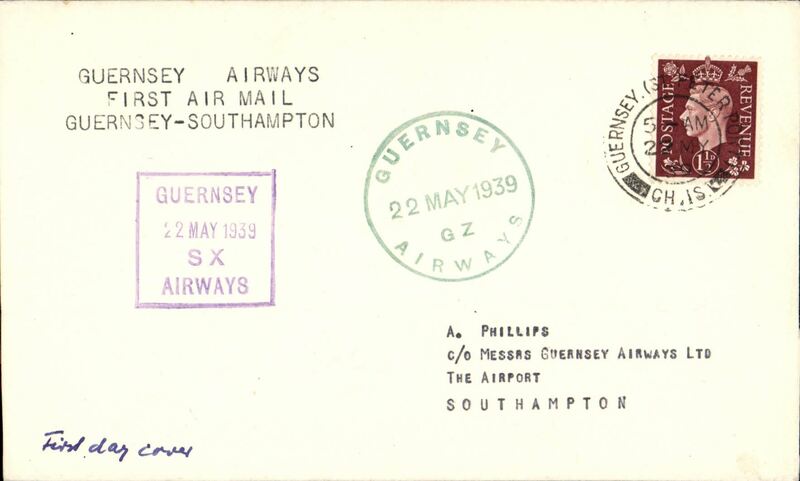 Guernsey Airways, F/F Southampton to Guernsey, bs 8/5, plain cover franked 1 1/2d, rectangular violet Company cachet. 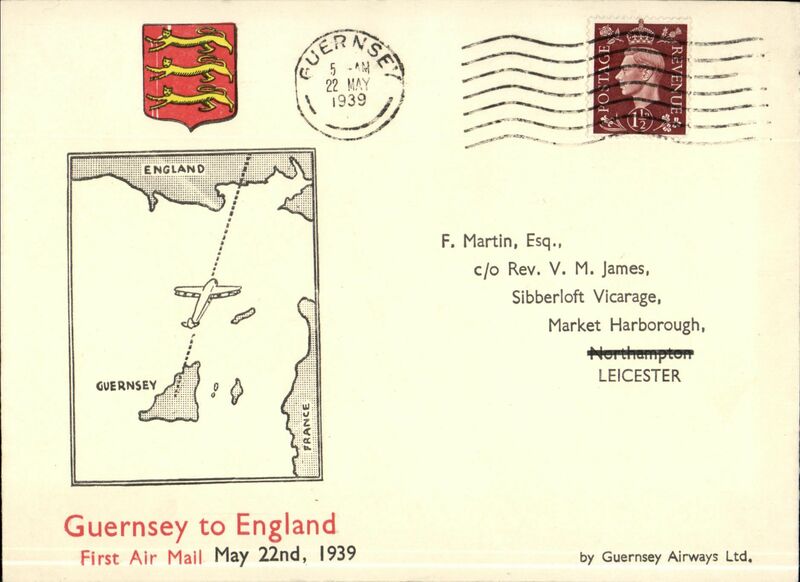 First flight Guernsey to Southampton, special 'Martin' souvenir cover franked 1 1/2d, canc 22 MY 39..
Guernsey Airways first flight Guernsey - Southampton special Martin souvenir cover signed by the pilot J.W. 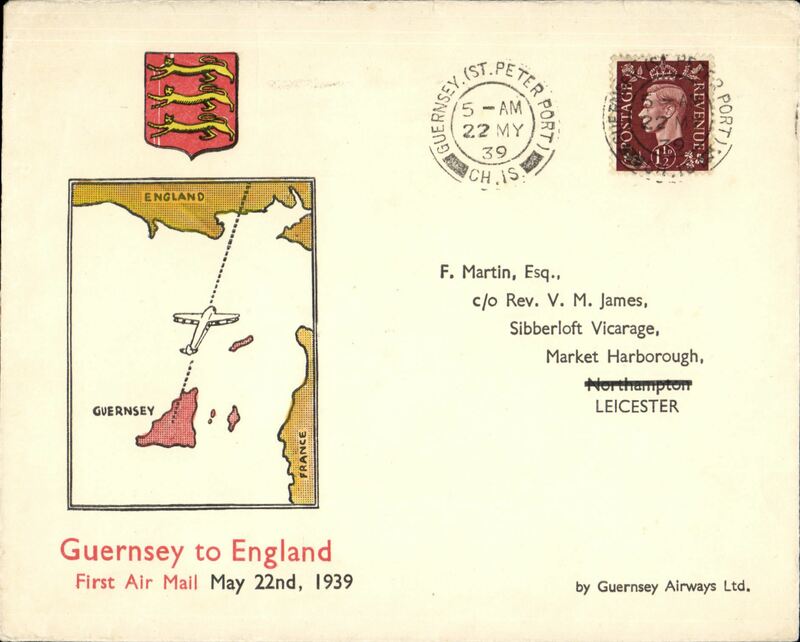 Pugh, scarce..
First flight Guernsey to Southampton, plain cover franked 1 1/2d cancelled Guernsey cds, bearing Type 4 and type 5 cachets, typed ' Guernsey Airways/F first airmail Guernsey Southampton'. 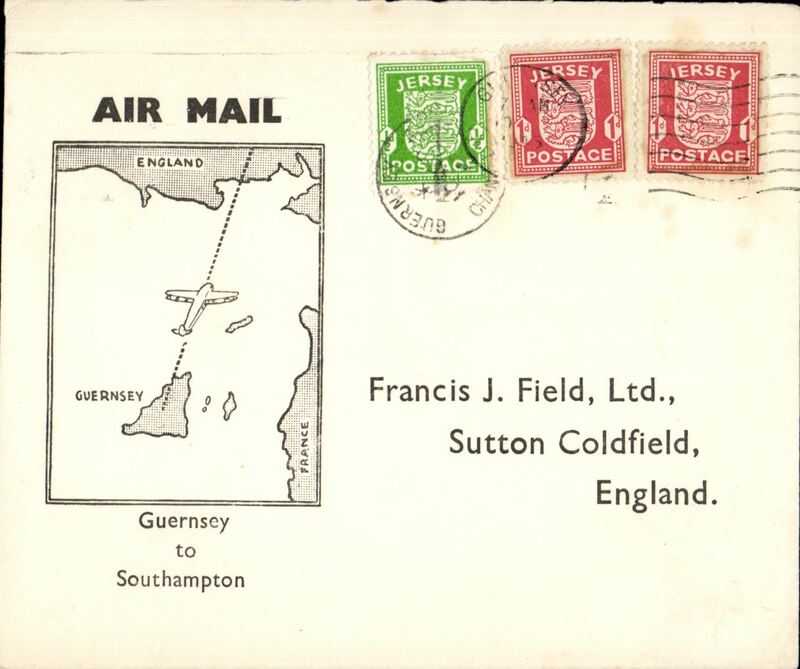 Rare F/F Inter-Island airmail, Jersey to Guernsey, bs 22/5, plain cover franked 1 1/2d, canc 'St. Helier, Jersey 5am/22 May 1939', typed 'Air Mail Service/Jersey-Guernsey'. 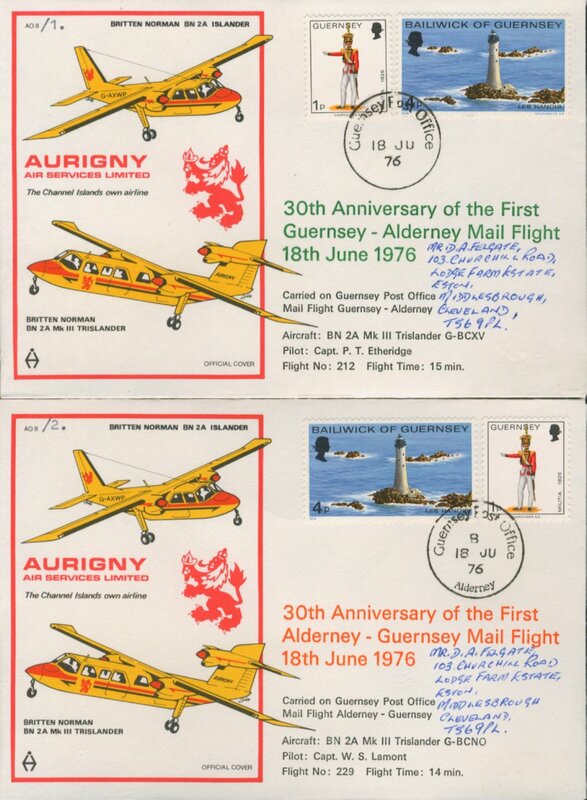 Genuinely flown covers are rare and bear the Jersey postmark of 5am. The bulk of the mail intended to be flown for souvenir purposes failed to be posted on time, and so missed th flight. See Redgrove pp103,104. Nice item in fine condition. 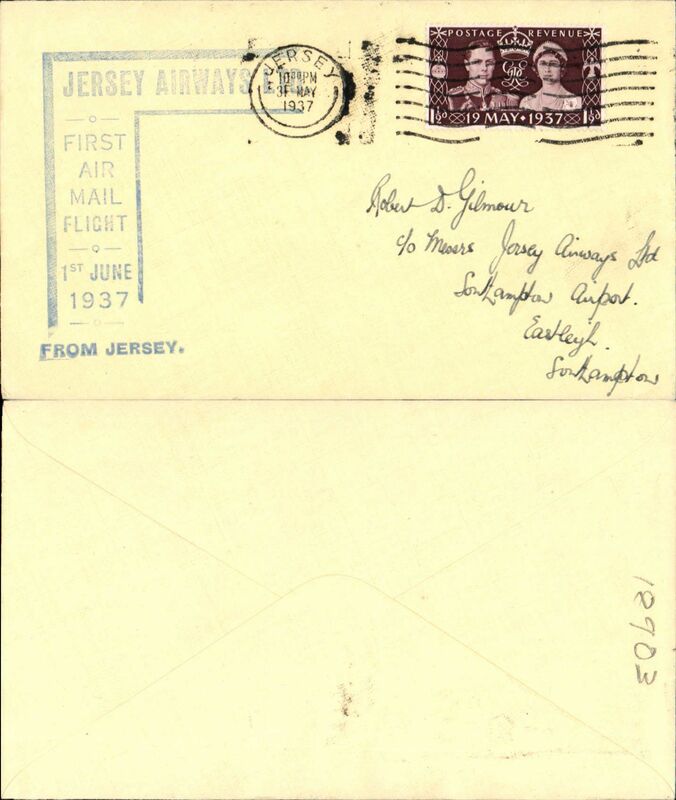 F/F Inter-Island airmail, Jersey to Guernsey, no arrival ds, Philatelic Magazine cover franked 1 1/2d, canc 'Jersey/5 am/22 May 1939'. 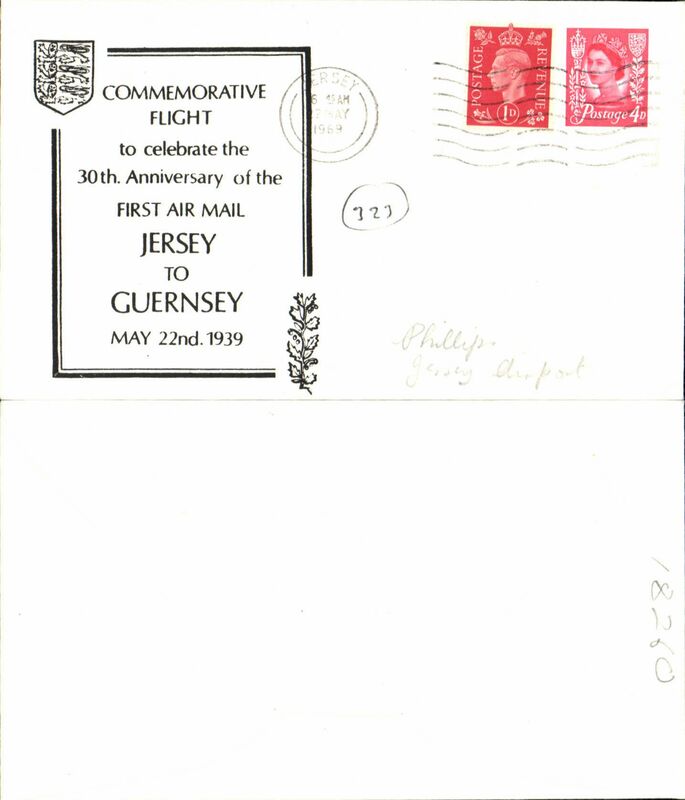 Flown covers are definitely rare, and bear the Jersey postmark of 5am, see Red grove pp103,104. Nice item in fine condition. 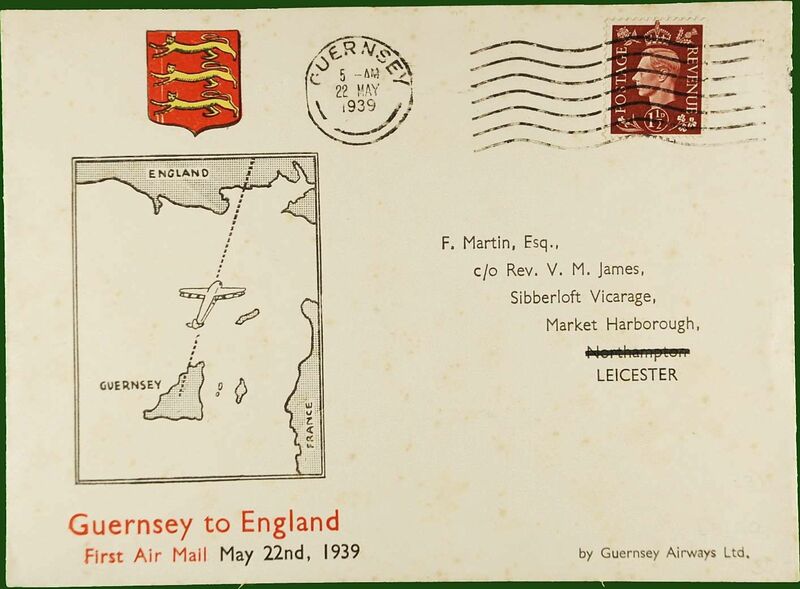 Guernsey Airways, F/F Guernsey to England, no arrival ds, franked 1 11/2d, canc 'Guernsey 5am 22 May 1939', illustrated Martin cover. 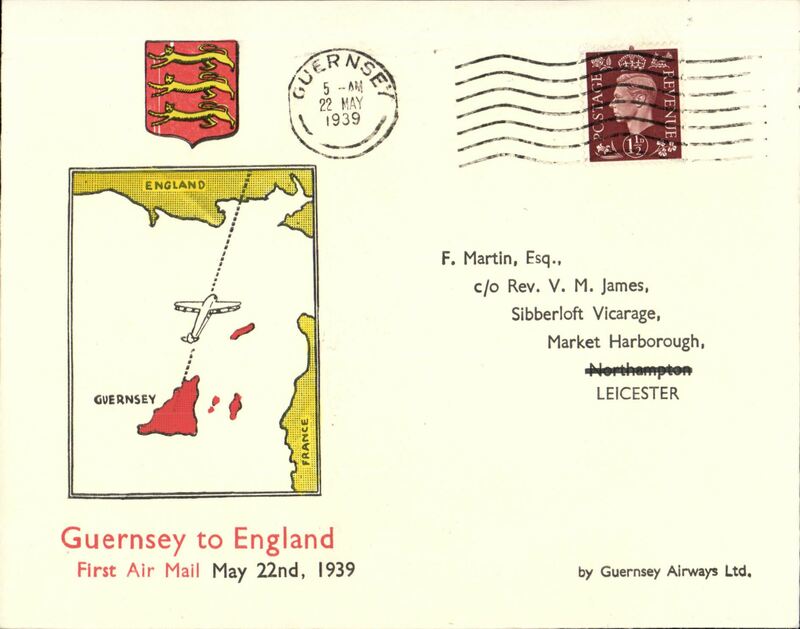 F/F Guernsey to England, no arrival ds, franked 1 11/2d, illustrated printed Martin cover, Guernsey AW. Faint tone spots, see scan. 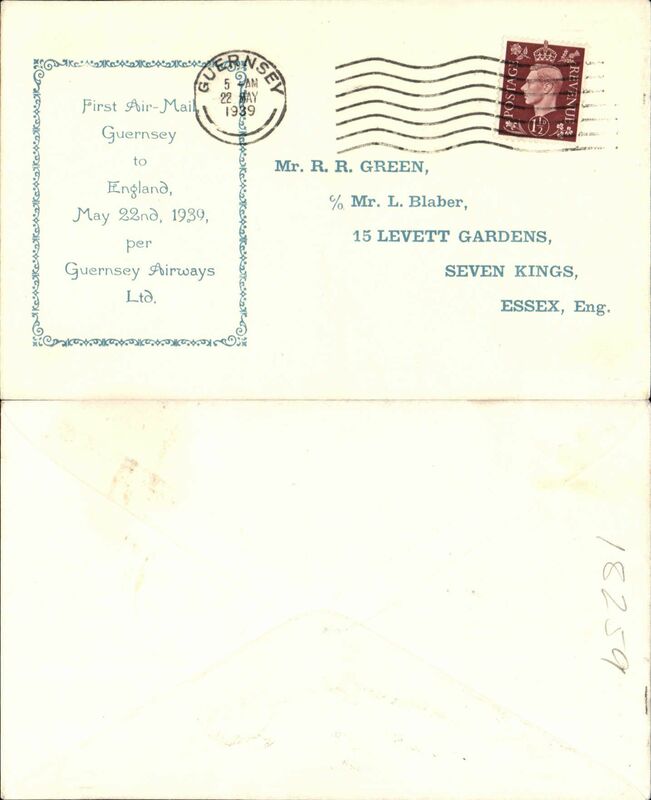 F/F Guernsey to England, no arrival ds, franked 1 1/2d, attractive printed green/cream 'R.R.Green' souvenir cover. 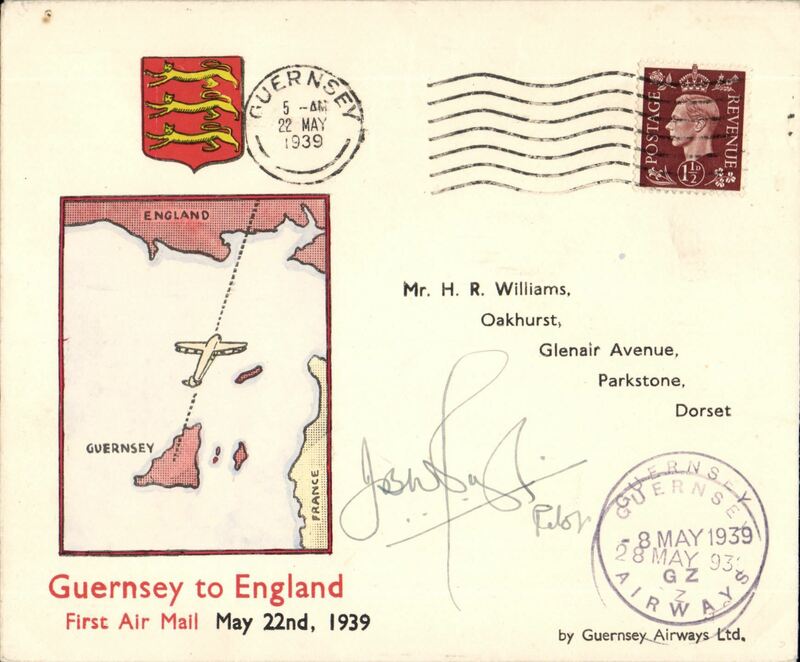 Guernsey Airways, F/F Guernsey to England, no arrival ds, attractive printed black/white souvenir cover, franked 1 1/2d, canc Guernsey 22 May 1939. German occupation cover to Hamburg, no arrival ds, franked 1/2d x2 Jersey German Occupation stamps canc Jersey cds and German 25pf to cover the Feldpost charge canc 'Feldpost "h" (Jersey) 28/5 cds, ms "Mit Luftpost", blue/white airmail etiquette. 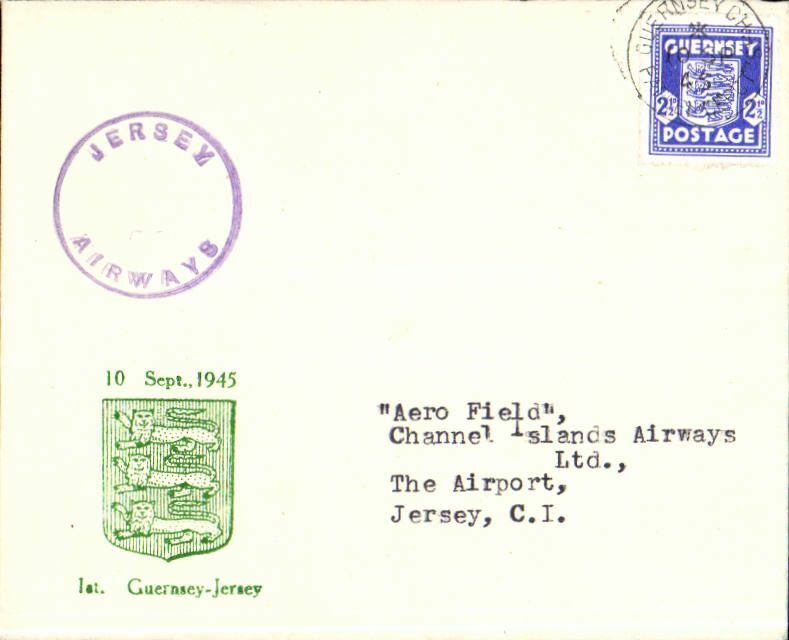 Channel Island Airways, first airmail service Jersey to Southampton, no arrival ds, souvenir cover franked 2 1/2d, official violet circular cachet. 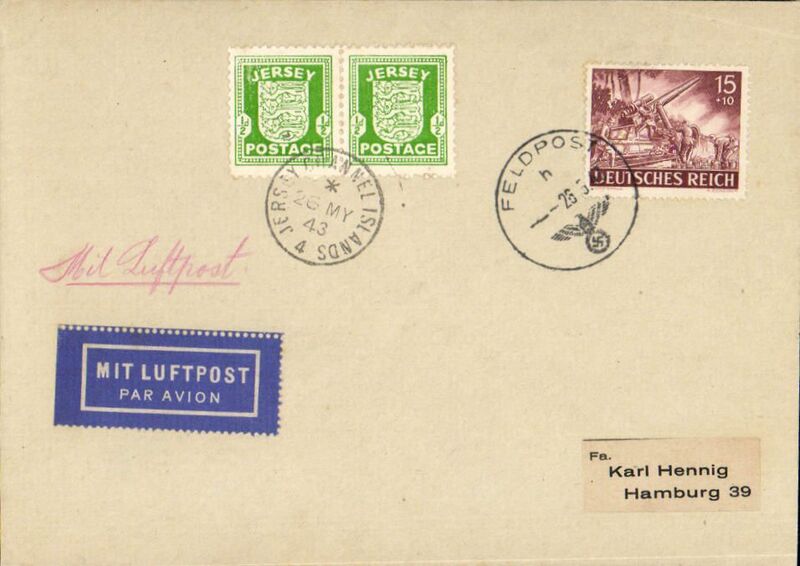 Channel Island Airways, first airmail service Jersey to Southampton, no arrival ds, souvenir cover franked German Occupation Local 2 1/2d stamp, official violet circular cachet. Channel Island Airways, first airmail service Guernsey to Jersey, no arrival ds, souvenir cover franked German Occupation Local 2 1/2d stamp, official violet circular cachet. 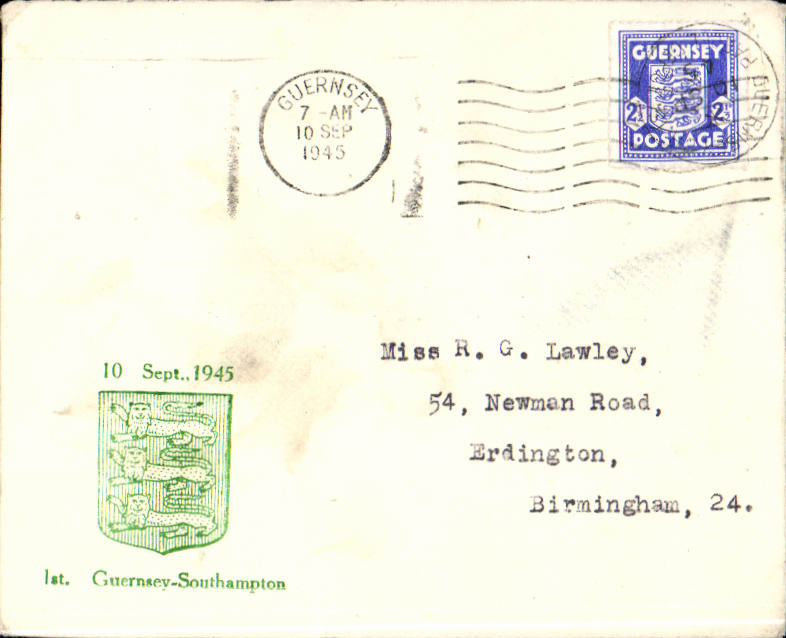 F/F resumed service, Guernsey to Southampton, souvenir cover franked Channel Island wartime issues. Flown by Channel Islands Airways Ltd created by an amalgamation of Guernsey AW and Jersey AW. 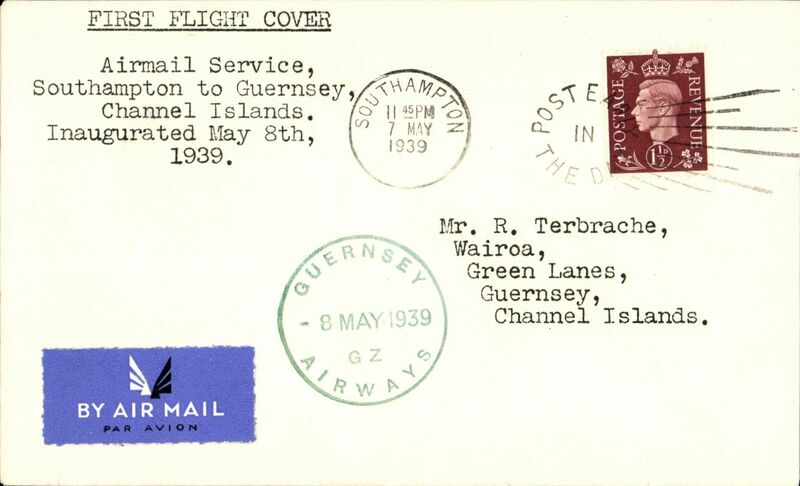 Channel Island Airways last flight, Guernsey to Southampton, no arrival ds, plain cover franked GB 3d, canc Guernsey 31 Mch 1947 cds, dark blue/white airmail etiquette. Uncommon. BEA, Guernsey to Southampton, first day of use of the new violet framed "BEA/30 Jun 1047/Guernsey" date stamp applied to letters carried on some flights only, franked GB 2 1/2d canc Guernsey 1 Jly, 1947 cds, and also a large, circular 'BM' (Boite Mobile) hs. Scarce item. 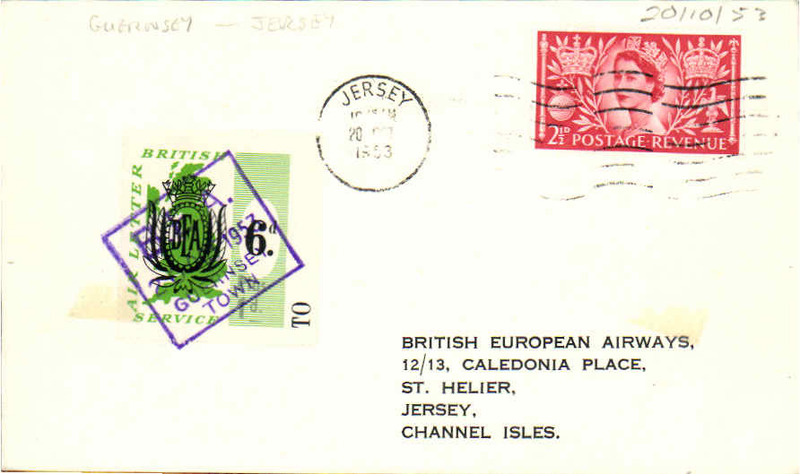 First day of extension of BEA letter service to Channel Is, Guernsey to Jersey, franked BEA 6d (3rd issue)+ 1d and POA. 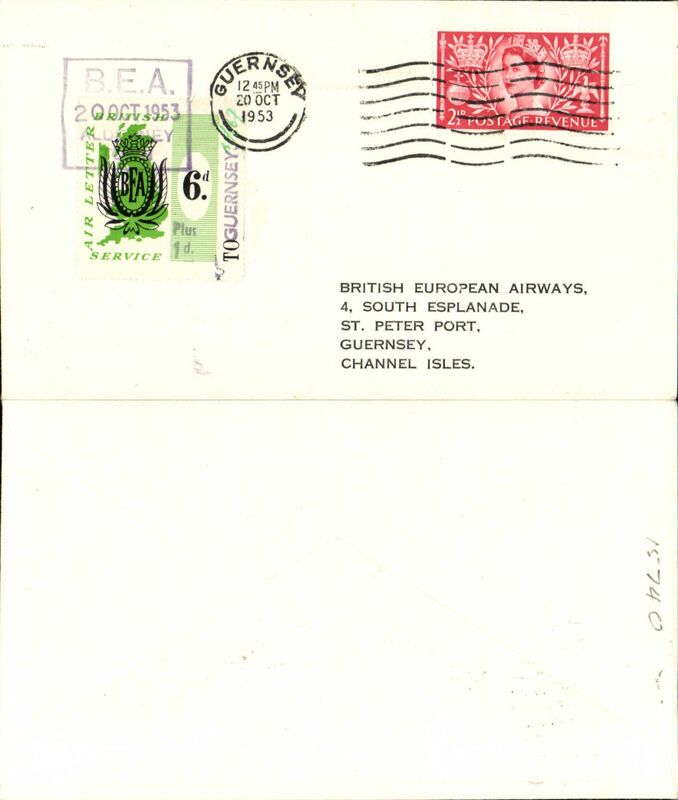 Extension of BEA letter service to the Channel Islands, Alderney-Guernsey, franked QE 2 1/d, also BEA 6d stamp surcharged 1d to make up new rate of 7d, tied by BEA Alderney dated depart cachet, posted on arrival in Guernsey. 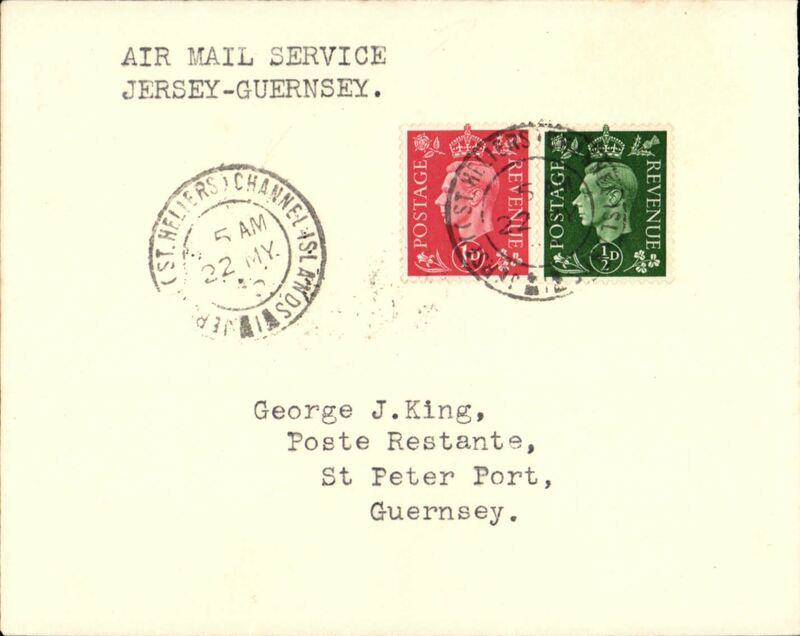 Extension of BEA letter service to the Channel Islands, Guernsey-Alderney, franked QE 2 1/d, also BEA 6d stamp surcharged 1d to make up new rate of 7d, tied by BEA Guernsey Town dated depart cachet, posted on arrival in Alderney. 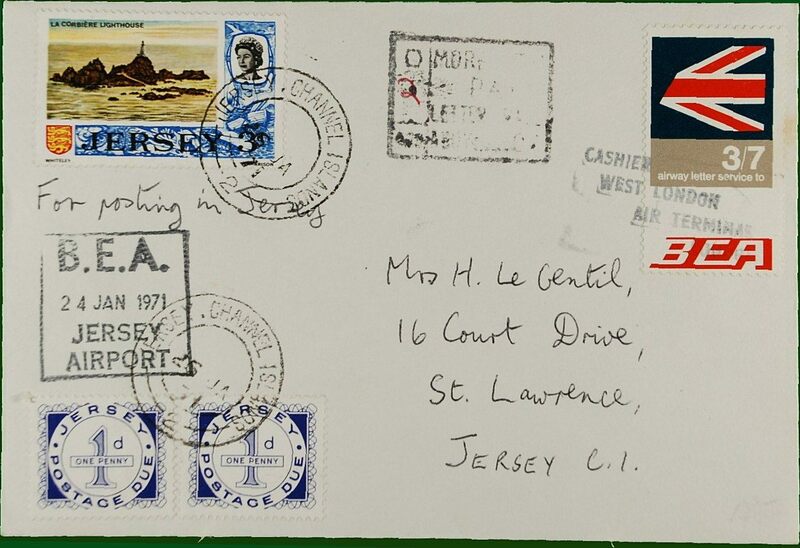 BEA Extension Air Letter Service to Channel Islands, Guernsey to Alderney, POA plain cover franked GB 2 1/2d canc Alderney postmark, and BEA air letter 6d tied by dated purple boxed BEA/Guernsey (departure) cachet. 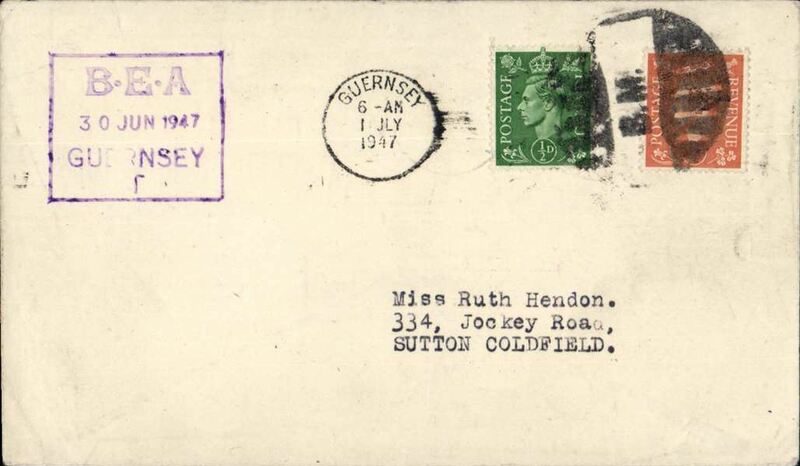 BEA Extension Air Letter Service to Channel Islands, Guernsey to London, POA plain cover franked GB 2 1/2d canc London SE1 postmark, and BEA air letter 6d tied by dated purple boxed BEA/Guernsey (departure) cachet. Guernsey Airways, F/F Southampton to Guernsey, 8/5, plain cover franked 1 1/2d, typed five line "Airmail Service/Southampton to Guernsey/Channel Islands/inaugurated May 8th/1939", green circular "Guernsey Airways 8 May 1939" Type 5 receiver on front..
30th anniversary first airmail Jersey to Guernsey, no arrival ds, attractive printed black/white souvenir cover, franked 5d, canc Jersey 22 May 1969. 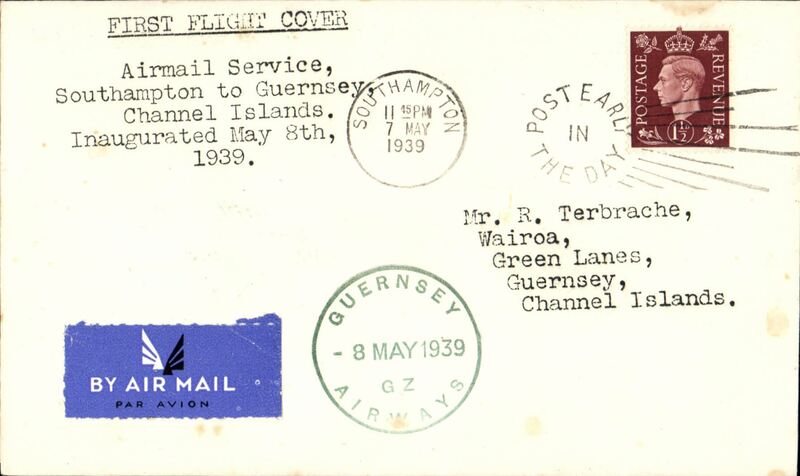 BEA, London Heathrow to Jersey, mailed during the postal strike period, commercial cover bearing BEA 3/7d airway label, cancelled 'Cashier ..../West Londo/Air Terminal/...', and 3d Jersey stamp. Also Jersey 2x1d Jersey postage due stamps, canc Jersey PO, to make up the additional 5d postal rate required for incoming mail to the Channel Islands. Interesting, see Lister pp 39,40. 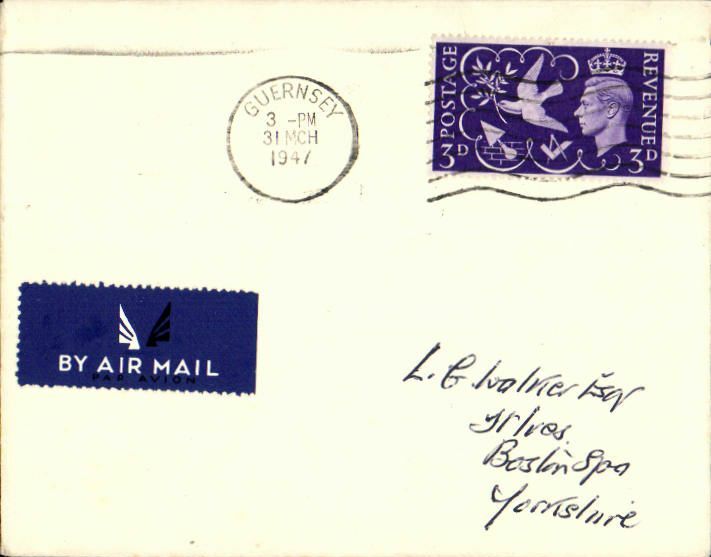 BEA, London Heathrow to Guernsey, mailed during the postal strike period, commercial cover bearing BEA 3/7d airway label, cancelled 'Paid by Cashier/4 Feb 1971/Heathrow', and 3d Guernsey stamp. Also Guernsey 2d postage due stamp, canc Guernsey PO, to make up the additional 5d postal rate required for incoming mail to the Channel Islands. Interesting, see Lister pp 39,40. 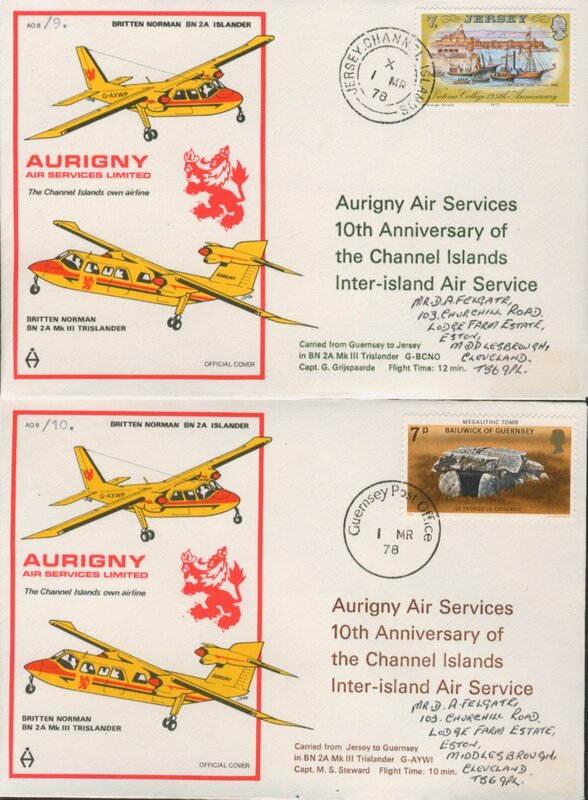 50th Anniv UK-Guernsey air service, FDI air set of five, long souvenir cover. 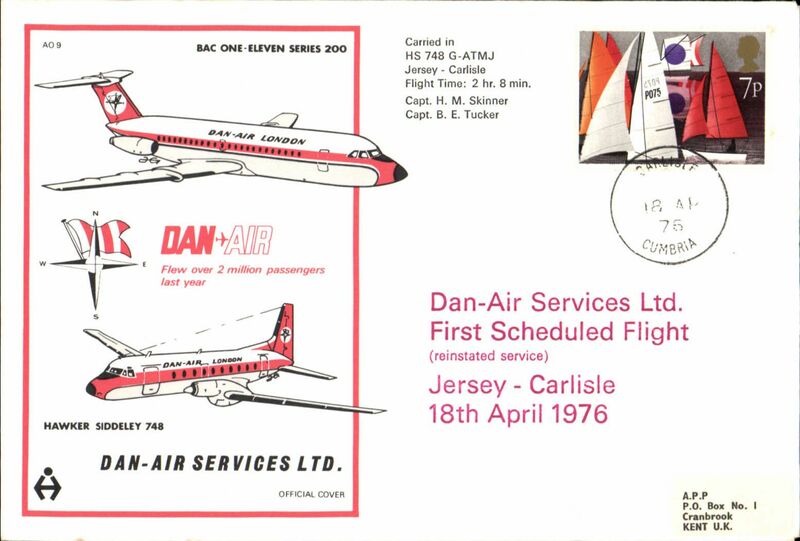 First scheduled service, Jersey to Carlisle, souvenir company cover, POA, airport depart hs, Dan Air. FDC franked FDI 40th anniversary International Civil Aviation organisation set of 4. FDC franked FDI 50th anniversary Alderney Airport set of 5. FDC franked FDI 50th anniversary Jersey Airport set of 5. FDC franked FDI 60th anniversary Jersey Airport set of 5.